Ethiopian Airlines, Africa’s largest airline group, announced that it will start four weekly flights to the Victoria Falls, site of the most spectacular waterfalls in the world, from March 26, 2017, with the latest B737-800 New Generation with Sky Interior. Ethiopian Airlines is the fastest growing airline in Africa. In its seven decades of operation, Ethiopian has become one of the continent’s leading carriers, unrivalled in efficiency and operational success. Ethiopian also offers special fares for tour packages to the major African tourist destinations such as Mombasa, Zanzibar, Kilimanjaro, Dar-Es-Salaam, Johannesburg, Maputo, Nairobi and Cairo. Victoria Falls, one of the Seven Natural Wonders of the world, is the only waterfall in the world with a length of more than a kilometre and a height of more than hundred metres. 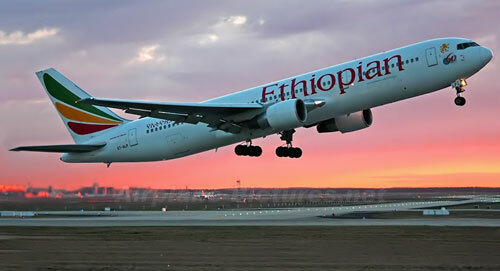 Ethiopian is currently implementing a 15-year strategic plan called Vision 2025 that will see it become the leading aviation group in Africa with seven business centres: Ethiopian Domestic and Regional Airline; Ethiopian International Passenger Airline; Ethiopian Cargo; Ethiopian MRO; Ethiopian Aviation Academy; Ethiopian In-flight Catering Services; and Ethiopian Ground Service. Ethiopian is a multi-award winning airline registering an average growth of 25 pc in the past seven years.